“You are two very wonderful and unique communities,” Father Ferland said, with many members of each parish filling St. Ambrose Church for the installation. “I am your parish priest, who will with you, do the justice of God; who with you will love the goodness that is inspired by St. Ambrose. And together, we will walk humbly the way of St. James, the way to God, our heavenly father. Following the Mass, the parishioners hosted a collation under a large white tent on the rectory grounds. Rev. Richard P. Desaulniers was born in Woonsocket, Rhode Island, on June 9, 1944 to Robert and Jeanne (Goulet) Desaulniers. He is the oldest of five children, with two brothers, Daniel and John Desaulniers, and two sisters, Janice (Desaulniers) Grondines and Renée Desaulniers. He grew up in the Bernon section of Woonsocket, attending both Mt. St. Francis Elementary School and Precious Blood Junior High School. He entered Our Lady of Providence Seminary High School in Warwick Neck, Rhode Island, in the fall of 1959 and graduated from its college in June, 1966, with a Bachelor of Arts degree in Philosophy. He was assigned to St. Bernard’s Seminary in Rochester, New York, where he was granted a Master of Divinity degree in 1969, and a Master of Theology degree in 1970. During the summer of 1969, he provided diaconate service at St. Joseph’s Church in Woonsocket. He was ordained to the priesthood by the Most Reverend Russell J. McVinney, D.D., Bishop of Providence, on May 23, 1970, at Precious Blood Church in Woonsocket, his home parish. He was the first priest to be ordained in that parish church. He celebrated his first Mass there the following day, May 24, 1970. His first assignment was at St. Jean-Baptiste, Pawtucket, Rhode Island, from 1970 to 1971. 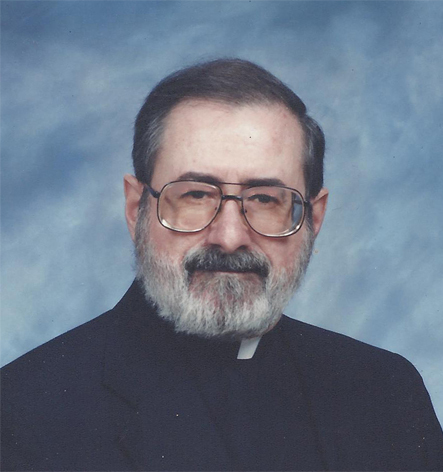 He later served at St. Joseph’s, Woonsocket, from 1971 to 1980, at St. Rita’s, Warwick in 1980, and at St. Francis of Assisi, Wakefield, from 1980 to 1984. In June of 1984, he was assigned as Associate Pastor at St. James Church in Manville, and appointed as Pastor there in June of 1993. Past civic involvements have included the following: Member, Social Progress Action Corporation Board of Directors; Chaplain and Treasurer, Woonsocket Jaycees; Chaplain, Rhode Island Jaycees; Chairman, Woonsocket Drug Commission; Chairman, Woonsocket School Curriculum Review Committee; President and Treasurer, Woonsocket Clergy Association; Chaplain, Woonsocket Fire Department. He was a member of the Board of the Mt. St. Francis Day Care, Diocesan Grievance Committee and Diocesan Priests’ Council. He served as Chaplain of the Manville Fire Department for twenty-eight years. Father Desaulniers also served as a member of the Town of Lincoln Personnel Board. He currently serves as a member of the Board of Directors of the Father Marot CYO Center and Treasurer of the SJ Scholarship Fund. On Sunday, May 23, 2010, the people of St. James joined him in celebrating 40 years in the Priesthood with a Special Mass of Thanksgiving followed by a reception at Kirkbrae Country Club, Lincoln, RI. On Sunday, June 29, 2014, Father Desaulniers celebrated a Mass of Thanksgiving on the occasion of his retirement at 10:00AM in Saint James Church. The Mass was attended by nearly 500 family & friends. Concelebrating the Mass was Rev. 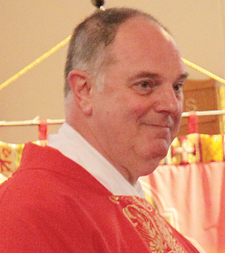 Thomas J. Ferland, Pastor-elect of St. James. Auxilary Bishop Robert C. Evans presided.